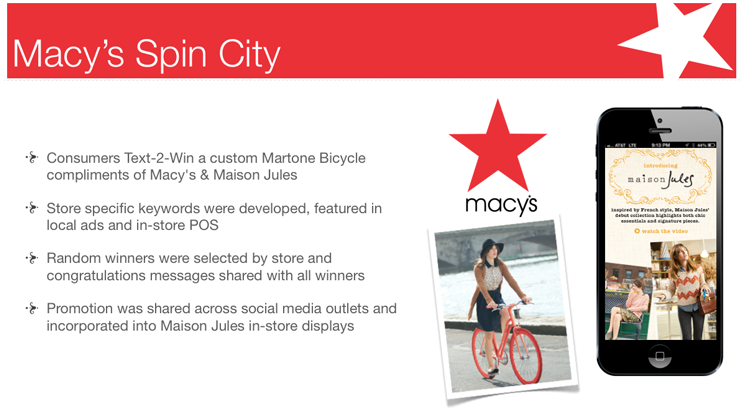 Macy’s was giving away hundreds of custom Martone Bicycles to promote their new Maison Jules fashion line. Each Macy’s store received its own custom keyword so consumers locally could enter to win the beautiful bikes that were part of in-store displays. The sweepstakes was promoted via print and across across social media outlets. Random winners were selected by stores and invited back to pick up their new bikes via ApolloBravo’s Text-2-Win platform.